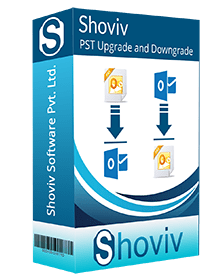 PST Upgrade and Downgrade tool from Shoviv is the best solution you can use for converting ANSI PST files into Unicode and vice versa without damaging the attachments of emails. 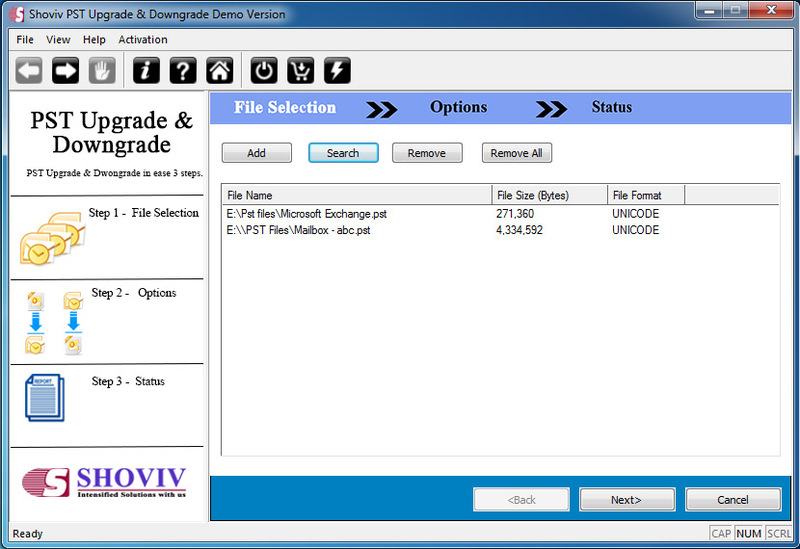 The data shift of email folders from ANSI/Unicode PST files to upgraded and downgraded PST files can be easily done. As well as this can also be done for other folders of PST files like sent items, drafts, inbox, Outlook. Meta data integrity will also be maintained once the upgrade or downgrade actions have been done. 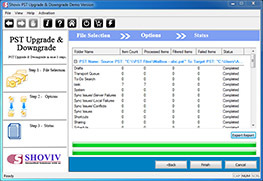 *Free Download allows to convert & save 25 items/folder from PST Upgrade & Downgrade. High end algorithms for upgrading PST files from ANSI format to Unicode format along with transferring attachments and other items without making any changes in emails. This feature makes you able to access your PST files in most updated Outlook account by converting them into Unicode format. During any downgrade, when you need to access your most updated PST files into older edition of MS Outlook which supports ANSI format, our PST Upgrade and Downgrade tool will help you flawlessly. It makes you comfortable when you want MS Outlook 2016 data into older versions. Large PST files having lots of data within as emails, attachments, contacts, events, tasks, etc will be highly supportive with this easy to handle tool. With no data loss, this tool accesses PST files of any size to upgrade or downgrade them and for this, the tool does not take too much time. Our software has endless support for multiple PST files to be accessed and converted to make them upgraded or downgraded at one go. 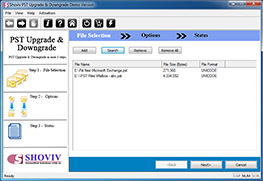 The process of upgrade or downgrade will be done in no time with our powerful software so, you do not need to think too much when bulk PST upgrade/downgrade is needed. With this facility which can be used while selecting Excluded Deleted Items, the deleted items and deleted folders of PST will be eliminated to be saved during PST upgrade or downgrade process. Selecting or not selecting this option is the whole sole choice of users. With the help of selecting this option in our software, you will be able to eliminate duplicate copies of PST emails while saving upgraded or downgraded PST files. In this process, a smooth scan has been done to find out repeated PST emails and it helps you to avoid getting an oversized PST file in result. All the editions of MS Windows Operating Systems are being supported by PST Upgrade and Downgrade software. The process is really smooth to be executed when you are using any version of MS Windows on your computer to use our Outlook PST downgrade/upgrade tool. No matter which version of MS Outlook you are using so long, you do not need to change that as our PST Upgrade and Downgrade software has supportive system for MS Outlook. 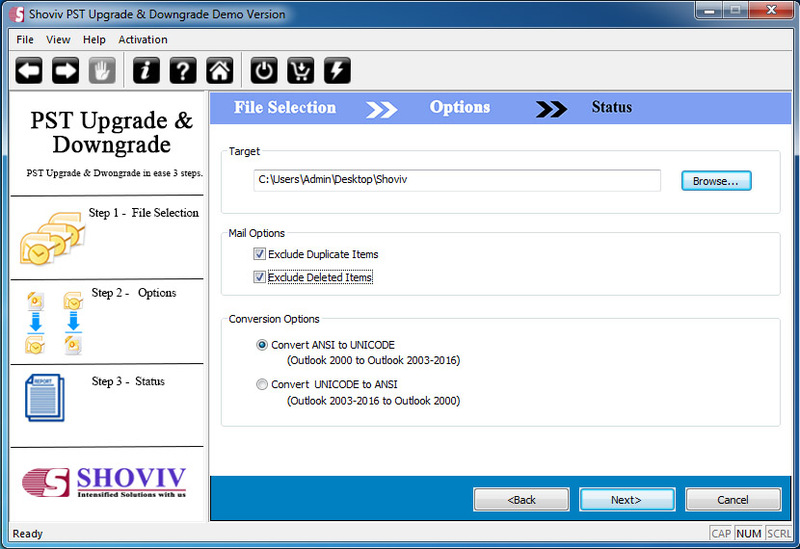 From earlier version of MS Outlook to older modes of this application are being supported by our software. During upgrade or downgrade of MS Outlook PST files, you will not have to lose the order of folders. Each and every folder of PST files will be shifted in similar hierarchy as maintained in previous Unicode or ANSI PST files. 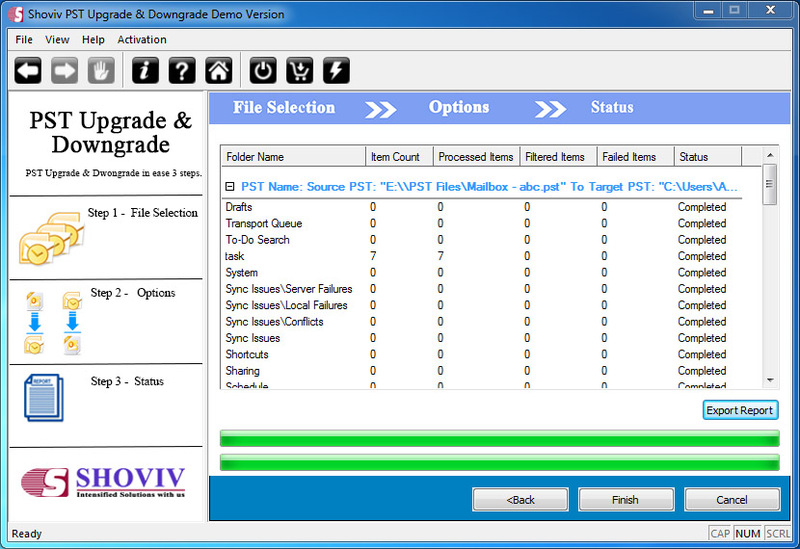 PST up-grade or downgrade process will not make any changes in folder orders with this tool. Free trial always helps to evaluate software productivity. One can have a free trial of the software and analyze the performance at granular level. The only restriction is, it allows to perform first 25 items per folder in one go. After satisfaction, you can proceed to purchase for a full version. Will this tool change any property or hierarchy during the execution of the PST upgradation? No, you will not face any kind of changes in the property of emails. Beside this, the software also doesn’t alter any folder hierarchy afterward the accomplishment of PST upgradation. You will get the same result during the downgrade process too. Is there any specific version of Outlook for which this tool works? No, there is no need to get any specific version of Outlook for utilizing. It supports entire versions of Outlook. You don’t need to worry to upgrade or downgrade your PST. You’re free to use this software on your Outlook from now. Is it possible to exclude duplicate email items while using the software? 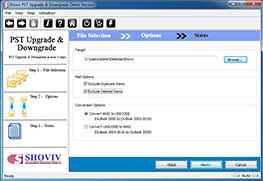 Yes, it is possible to exclude duplicate emails while saving upgraded or downgraded PST files using Shoviv upgrade and downgrade PST files tool. Thus, this tool is originated gorgeous to work as concise and accurate to reduce future issues and load. Is there any technical desk to help me if I find myself unable to work with this tool properly? Why not, Our 24*7 technical support team is always standing front to solve your query. Our technical experts and versed professional always assist the user in operating our software application. You can ping us any time in our chat room which is available on our official website. A tool free number is also given there for better connectivity with our prestigious clients.